In the wake of the infamous LizaMoon which has flooded an impressive number of databases all over the world with SQL Injection, infecting more than 1,500,000 URLs according to Google Search, the next frontier of Information Security to which security vendors are likely to move, is the branch of application security. The last vendor in order of time to make an acquisition (just a couple of days before LizaMoon was detected) was Intel McAfee, which decided to enter the database security market (estimated more than $ 600 million in 2012) acquiring Sentrigo, a Santa Clara based company focused on database security, former member of the SIA Technology Partnership Program (McAfee Security Innovation Alliance) and currently linked to McAfee by an OEM partnerships. The red Infosec Colossus of Santa Clara is just the latest player to enter this market, following the example of IBM, which offers a complete Application Security solution since 2009, thanks to the acquisitions (in rigorous chronological order) of DataPower (Web Application/XML Security), Ounce Labs (Code Analysis) and Guardium (Database Security). A set of solutions which form respectively the Websphere, Rational and InfoSphere Guardium Security Solutions. McAfee and IBM are accompanied by Fortinet, another important security player which has been active in this field for some years. Fortinet has been investing in database and application security since 2006, and even if it lacks a code analysis solution, it offers a portfolio which extends up to the database (scanning and monitoring) level, through the acquisition of IP-Locks, and up to XML /Application Firewall, thanks to its offer of FortiWeb appliances. 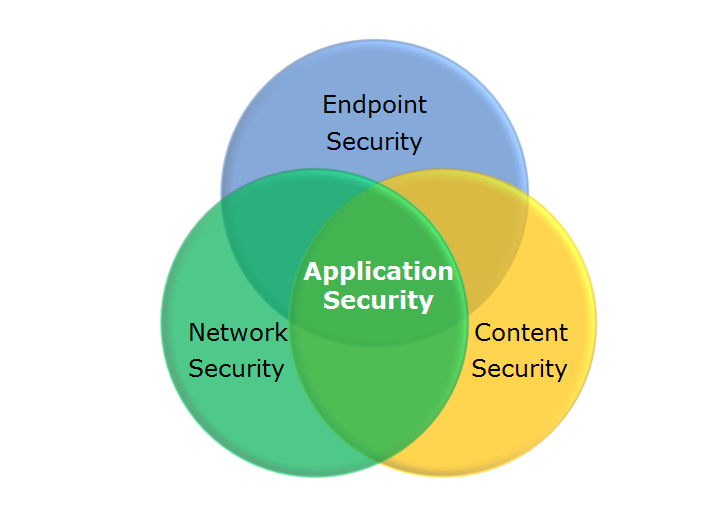 As you may notice the three examples above are particularly meaningful of how the security is now converging towards application security. Although McAfee, Fortinet and IBM have very different backgrounds, they are converging to a comparable application security offer: McAfee approached the problem from the endpoint security, which is its historical strength, IBM from the content security, since its adventure in security has started from the acquisition of ISS, and finally Fortinet from the network security, well represented by its Fortigate appliances. According to my personal model, the complete cycle of application security moves on four levels: training of developers is the first level and the necessary foundation upon which an application security project is built. Where the ability (and security awareness) of developers does not arrive, Vulnerability Assessment/Penetration Test (second level) may be enforced to check the level of security of the applications. If we move to a more “technological” plane there are two more levels: they consist respectively in Code Analysis (a preventive measure) and XML/Application/Database security solutions implemented with dedicated software or appliances (an infrastructural measure). Please consider that (an aspect which is not secondary) these kindw of solutions are also driven by increasingly stringent regulations, such as PCI-DSS, and emerging “De Facto” standards such as OWASP (Open Web Application Security Program). If IBM is currently the only vendor to cover the three areas of application security (code analysis, XML/Web application security and database security), in addition to McAfee and Fortinet, there are other vendors at the door, looking at this market with great interest starting from Cisco Systems, provided with a great ability to execute, but currently focused primarily on its network-centric approach by mean of its ACE family of XML Firewalls, and HP, which, even if currently leaks an XML/WAF or Database Security solution) is approaching the world of Application Security starting from code analysis thanks to the acquisition of Fortify, considered by many observers the market leader in this field. Actually, alongside these vendors there are more players which, even if more focused on network security, however, look carefully in this market by offering niche solutions, as is the case, for instance, with Checkpoint, which combines its traditional firewall modules (or software blades according to the current terminology) with Web Security functions specifically tailored for application threat, or also Citrix which approaches the problem from the Application Acceleration/Distribution perspective.